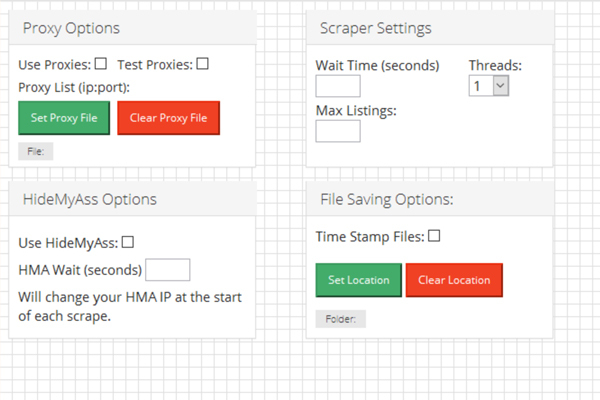 Our super simple interface makes Local Scraper easy to use no matter what your experience level. Press one button and the scraping begins. 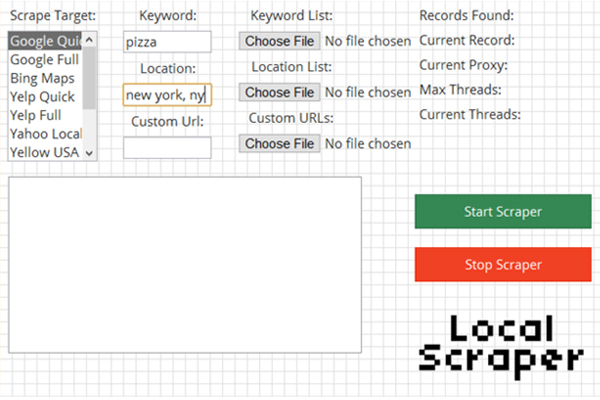 All data scraped with Local Scraper is saved to a easy to use CSV format. 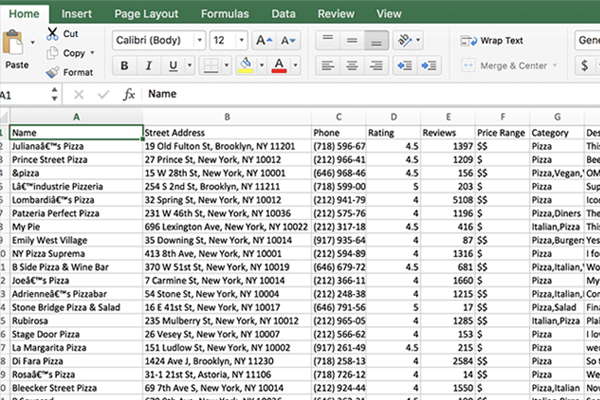 Open it in Excel or directly import the data into your CRM. Full video walk tutorials to explain what every feature does and how to best run the program. Easy enough for anyone to follow along. "How Automated Web Scraping Can Save You Time and Money"
How much would your business grow if you had the contact details of thousands or tens of thousands of targeted businesses? Websites like Google Maps, Bing, Yahoo, Yellow Pages and Yelp have the largest databases in the world of business listings. But they are not willing to just freely share that information with the rest of us. Until now there wasn't much you could do about it. Do you really want to spend hours manually copying and pasting this data off their websites? No way, you have a business to run and money to make. What you need is a fully automated solution that will go out and gather these targeted business listings for you. And I have just the solution and its just as great as it sounds. Use the data for targeted mailing campaigns, phone and email lead generation, or even populate your own websites with niche business listings. Local Scraper makes lead generation easy by doing all the hard work for you. All it takes is the press of one button. Since its launch over 5 years ago Local Scraper has helped thousands of Customer Reviews just like you grow their business with great success. I have had countless emails from successful clients that have used my program to build databases for websites, hunt for prospective clients, and produce massive mailing campaigns. The reason why Local Scraper users have been so successful over the years is because of niche targeted data. If you wanted to sell your services to a specific type of business where would you start? What are their addresses? Phone numbers? Websites? With Local Scraper you could have the full contact details of thousands of targeted businesses in just minutes. Want yogurt places in New York? Irish pubs in Miami? How about dentists in Salt Lake City? With Local Scraper is easy to target exactly what you want where you want. Before you would have had to hire a programmer and pay a very expensive hourly rate to have a custom scraper built for you. Maybe you would have tried to contact a data mining company to buy a existing completed database, but these cost thousands of dollars and are often full of outdated data. The problem with both of these solutions is that they are single purpose. What if next week you decide that you also need to include coffee shops from a different place or site? You would need to start this process all over again. By using these methods you do not have full control. You always have to rely on someone else to complete the job for you which can be expensive and time consuming. No one wants to be in that position. With Local Scraper you are in full control. You decided what you need and when and you make it happen. Our one-time purchase system keeps things affordable and has no hidden costs down the road. Local Scraper is an easy to use solution that can gather targeted business details even while you are asleep or out to lunch. Your own custom scraping robot that will scrape whatever you want, whenever you want, fully automated. Local Scraper was built with Customer Reviews in mind. Unlike other programs there is no learning curve, no complex user interface, and absolutely no programing required. Local Scraper was developed with the KISS (Keep It Simple Stupid) method. The entire program literally runs with the touch of a single button anyone can use it. We even have video tutorials to help get you up and running in minutes if your new to scraping. I know what you're thinking. Wont a single program limit me and what data I can gather? The answer is a resounding no. 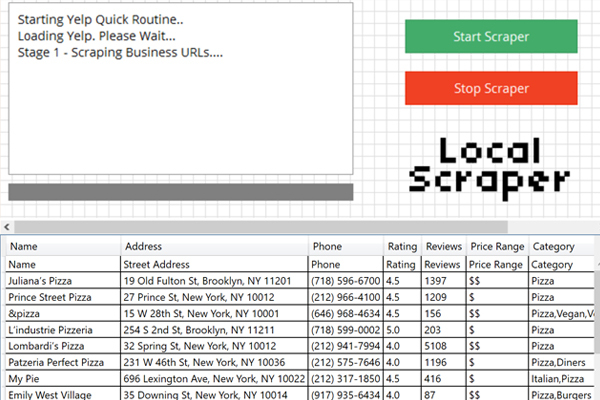 Local Scraper can scrape data from 9 of the largest business listings websites in the world. Google Maps, Bing Maps, Yelp, Yahoo Local, Yellow Pages USA, Yellow Pages Canada, Yellow Pages Australia, Yellow Pages New Zealand, and Yellow Pages UAE. If the information you are looking for isn't on any of these nine websites it does not exist online. Other companies offer similar data scrapers but none come close to the all in one solution that Local Scraper offers. With Local Scraper you get one easy to use program that does the work of eight custom scrapers, and one programmer who provides fanatical support. But what data does Local Scraper actually scrape? Each website is different in the data that they show each business but Local Scraper was designed to grab as much information as possible from each website. Check out the chart below to see just what you could be scraping from each website. Local Scraper now includes 12 full scrapers across nine websites listed below. Google Maps, Bing Maps, Yelp, Yahoo Local, Yellow Pages USA, Yellow Pages Canada, Yellow Pages Australia, Yellow Pages New Zealand, Yellow Pages UAE! Use the data you scrape for lead generation, targeted mail campaigns, SEO clients, reputation management clients, niche databases, and more. With a 8 year track record of success and thousands of happy customers we know data scraping and we know you're going to love Local Scraper. Great program, practically a business saver! After using Local Scraper for a few months I truly can't imagine how we used to do business without it. This product is simply amazing. When Grant said it was set and forget it he meant it. I have been running the program overnight and waking up to csv files full of data. I can't believe I didn't buy this program sooner. It's ridiculously easy to use and I wouldn't call my self a computer person by any means. If I can do it anyone can. We have been using LocalScraper for months now and have built several private databases already with the data we scraped. Support for this program has been amazing. We were having a few issues and they were resolved in a matter of hours. The program paid for its self after our first scrape. We gathered the same data that we were about to buy for twice the price. We are running 3 copies of the program all at max threads with no problems. This program is a beast. We know that not every job is the same that’s why we provide 3 easy pricing options for customers. You can now tailor your subscription to better fit the size and scale of your scraping project. If you have a small scraping job or want to try out the program before committing long term then the one-month subscription is right for you. If you are interested in gathering more data consider the 6-month package and take advantage of the savings. Finally, for power users that need scraping data as a foundation for their current project there is the 1-year package with the greatest savings. All 3 options give you the same great scraper and support so there is no wrong choice! Full Proxy and VPN Support. * Local Scraper is a Windows software and works on Windows Vista, Windows 7, Windows 8, Windows 10 as well as Windows Server 2003, 2008 and 2012 on both 32 and 64 Bit machines. Want a free 24 hour trial of Local Scraper? Click Here! to try before you buy. Use our built in Email Hunter system to find even more emails than before. Email Hunter checks over 25 pages of the business website for a valid email. Use the lists feature to automate your scraping. Scrape data while at lunch or at home asleep. The bot keeps working even if you're not. New to scraping and data mining? Don't worry we have you covered. Get up and running in minutes with our video tutorials. Does your business need addresses for a direct mailing campaign? Forget about hiring an expensive company to provide you will addresses and gather them your self with Local Scraper. If you just used Local Scraper once for one small mailing campaign in your town it would have paid for its self many times over. Do you sell a niche product to florists? Just use your town/zip/city as the location and 'florists' as the search term and you will have a full list of addresses ready to go in a matter of minutes. Local Scraper gathers emails, phone numbers, websites, and addresses. If you sell a product to a niche group of business you could have a full list of their phone numbers in a matter of minutes ready to send over to your sales team. Does your company do SEO or Online Marketing? Check out the business's listing page on the site you scraper to see if they need social services, you can also check out their website to see if they need SEO or PPC services. Call them up or mail them a flyer and gain a new client. Do you want to own the next Yelp? Directory sites are huge business and there is always money to be made in niche directories. Do you live in a small town and want to make a niche site for your town for Restaurants? With local scraper its easy to gather data on niche businesses in your area. Once you have the data simply upload it into your data base and you could have a directory site up on less than a day. Our easy to use csv format can even be directly imported into a SQL database. These are just a few of the many ways our clients are using Local Scraper. You could follow their lead or find your own way of profiting for the data that Local Scraper collects. Start your risk-free trial by filling out the form below. Download instructions will be sent to you by E-Mail. Local Scraper is a Subscription? Local Scraper requires constant updates to continue to always have a 100% working solution. The program has near weekly updates and is always a work in progress. To offer the best product to our customers we need to stay on top of site changes and updates. So unlike other products your subscription guarantees your scrapers are always up to date and 100% working. Customers can UnSubscribe at any time from your PayPal account. Can I run Local Scraper on my Mac? Local Scraper requires Microsoft Windows to run. You can run the program on a Mac computer by installing Windows with BootCamp or VMWare Fusion. Local Scraper uses Microsoft .Net 3.5 and 4.5 so it will never have true native Mac OS support. Local Scraper auto saves all scraped results into a easy to use CSV file. This file can be located in the same folder as the scraper itself and will be named using your keywords and location used. Download a sample CSV file. This sample is from Google Maps and was a scrape for Plumbers located in Huntington Beach, CA. You can scrape small amounts of data without proxies. But major projects will require them. Each site is different in how it handles suspected bots. Every effort has been taken to not need them but they may be necessary if you are a heavy user. Am I limited to X results? No. The only limits for the data you get are the ones set by the sites themselves. This varies from site to site and may change we have no control over the data we scrape. What updates and support can I expect to receive? The purchase of LocalScraper includes 1 year of access to any updates and improvements made to the software. Scrapers require constant upkeep and maintenance, and LocalScraper is dedicated to meeting those requirements. We're constantly working to ensure that LocalScraper works as good, if not better than originally intended. You will need Microsoft Windows installed and at least 2GB of RAM. We support Windows Vista, Windows 7, Windows 8, and Windows 10. Scraping is very memory intensive so the more system memory(RAM) you have the better. It is not recommend that you run the program on a Windows XP computer. If you are a Mac users you will need to install Windows either via BootCamp or a Virtual Machine such as VMWare Fusion.